^ Space.com staff. China Tests Powerful Rocket Engine for New Booster. Space.com. 30 July 2012 [2016-11-10]. （原始内容存档于2016-11-06）. The more capable Long March 5 rocket is expected to help the country achieve its goal of constructing a space station in orbit by the year 2020, as well as play a key role in China's future space exploration aims beyond low-Earth orbit. The rocket's maiden launch is expected to occur in 2014. ^ 2.0 2.1 Long March 5 Will Have World's Second Largest Carrying Capacity. Space Daily. 2009-03-04 [2012-09-04]. （原始内容存档于2012-09-03）. ^ 为啥长征五号是“大火箭”？-新华网. www.xinhuanet.com. [2018-02-18]. （原始内容存档于2018-02-19）. ^ （新华全媒头条）大块头有大智慧——解码长征五号大火箭-新华网. news.xinhuanet.com. [2018-02-18]. （原始内容存档于2016-11-04）. ^ “超低温运行”“二次启动”：长征五号火箭发动机取得重要突破-新华网. www.xinhuanet.com. [2018-02-18]. （原始内容存档于2018-02-19）. ^ 技术解读. 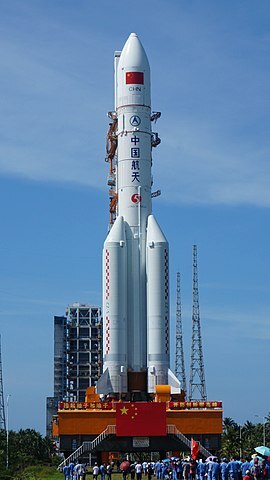 zhuanti.spacechina.com. [2018-02-18]. （原始内容存档于2016-11-15） （英语）. ^ 白国龙、任珂. 中国成功发射实践十七号卫星. 新华社. 2016-11-03 [2016-11-10]. （原始内容存档于2016-11-04） （中文）. ^ 8.0 8.1 长征五号遥二火箭发射失利. 中新网. 2017-07-02 [2017-07-02]. （原始内容存档于2017-07-07） （中文）. ^ 长征五号失败调查 或年底查清 嫦娥四号或探月推迟. 中关村在线. 2017-09-30 [2017-09-30]. ^ 长征五号生产总测结束，准备首飞. AirForceWorld.com. 2016-08-17 [2016-11-12]. （原始内容存档于2016-10-10）. ^ 11.0 11.1 中国最大推力新一代运载火箭长征五号首飞获得圆满成功. 中国新闻网. [2016-11-12]. （原始内容存档于2016-11-06）. ^ 科技日报. 长征五号总师揭秘起飞前惊魂163分钟. 凤凰资讯. 2017-05-28 [2017-05-28]. （原始内容存档于2017-05-28）. ^ 长征火箭第238次发射 这次填补了一项国内空白. 凤凰卫视. 2016年11月3日 [2016-11-12]. （原始内容存档于2016-11-07） （中文（简体）‎）. ^ 余晓洁. 长征五号遥二火箭飞行故障调查完成　今年底将实施长征五号遥三火箭发射. 新华网. 2018-04-16 [2018-04-16]. （原始内容存档于2018-04-16） （中文）.